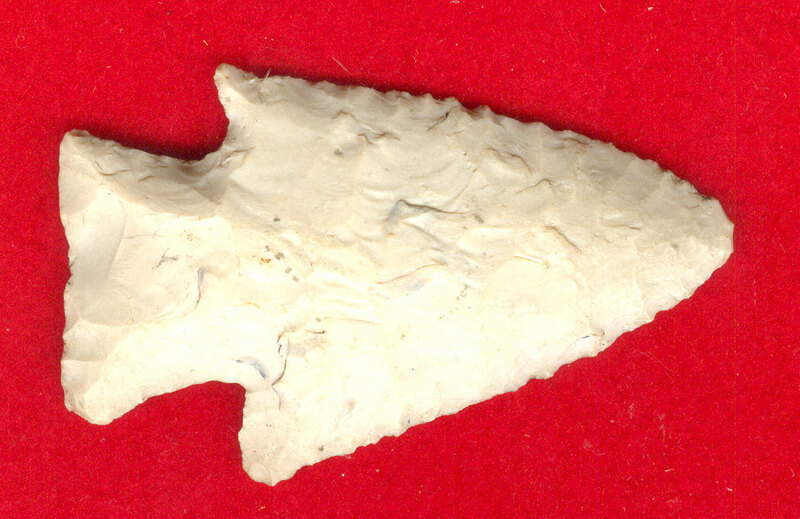 A Medium Size, Well Made, Visibly Aged And Anciently Use Sharpened Hardin Point That Exhibits Surface Sheen And Stone Aging Coloration Patination, Aged Surface Deposits, Deep Aged Stained Hinge Deposits, Correct Rolled Basal Stem Edge Hafting Dulling, Correct Early Style Blade Flaking, Correct Ancient Beveled Blade Sharpening Use Reduction, Correct Material And Manufacture For The Area Found. Found On The Norm Pearson Farm In Hamilton County, Illinois. Ex-Bill Tatu And Mike Kruse Collections. Blade Sharpening Has Reduced The Length More Than The Width On This Nice Example! Includes Gregory Perino ( 8/28/96 ) And Ken Partain Certificates Of Authenticity!